World War II ended 70 years ago and we’re still dealing with the havoc the global conflict wreaked on American drinking habits. That’s especially prevalent every Cinco de Mayo. No, this isn’t another Corona-bashing diatribe; it’s not about beer. This is about Mexican spirits. After the second World War, all of the returning soldiers created a colossal demand for cheap spirits and American importers looked to Mexico for the supply line. Artisanal distillers South of the Border had been producing fine tequila for centuries, but much of the more refined stuff wasn’t making it past the villages in Jalisco (tequila’s home state) and Oaxaca (mezcal central) in pristine form. U.S. businesses were buying up as much of the liquor as they could, adulterating it with cheap additives to scale it up, shipping it to the states and getting the American public inexpensively hammered on shots and cloyingly sweet margaritas ever since. It really wasn’t until more than a half-century after V-J Day that the U.S. market started to undo some of the damage and give tequila the image makeover it so desperately needed. It was at the turn of the millennium that Patrón Spirits, under the leadership of its then-new CEO Ed Brown, proved that tequila could indeed be a classy product. And, following on the heels of the revolution that recently had swept the vodka category, the super-premium tequila tier was born. A similar dynamic is playing out with tequila’s kissing cousin, mezcal. Part of the premiumization shift in mezcal is a direct result of the groundwork laid by the better-known Mexican spirit. But, perhaps more so, it owes a bigger debt to international politics. Exactly 20 years ago this year mezcal received its Denomination of Origin designation, officially recognizing it as a distinct product native to its region. A decade later, in 2005, Mexico’s law standardizing mezcal production went into effect. Enforced by the Consejo Mexicano Regulador de la Calidad del Mezcal—more commonly known by the mercifully simple acronym, CRM—the standards abolish (in theory, at least) the rampant adulteration that had been typical. CRM also defined two segments within mezcal: 100 percent agave (as in tequila, “the good stuff”) and “mixto” (mixed). Mixtos must get at least 80 percent of alcohol from agave and no more than 20 from other fermentable, distillable sources. That’s an even stricter threshold than the one for tequila; mixto tequilas need only be 51 percent agave. Mezcal, by and large, is still relatively unknown in the U.S.; at least 99 percent of drinkers aren’t aware of how it differs from the much more widely consumed spirit that inspired Pee-Wee Herman’s favorite song. As mentioned previously, tequila must be produced in Jalisco; mezcal typically is native to Oaxaca. Tequila must be derived from one specific type of agave—agave tequilana, aka blue agave—mezcal may use any of 30 different agave species as its base. For that reason, distillers like to think of it as the “fine wine of spirits,” since flavor variations among the different base plants are not unlike the wide range of defining characteristics among grape varietals. Of course, that’s a bit too “inside baseball” for the vast majority of consumers; there’s one very pronounced flavor element that immediately sets mezcal apart from its close relative: smoke. In that respect, it’s less a “fine wine” and more an Islay Scotch whisky. Before the agave is fermented and ultimately distilled, artisans bake the heart of the plant in underground charcoal-heated ovens, imparting the not-so-subtle smokiness. 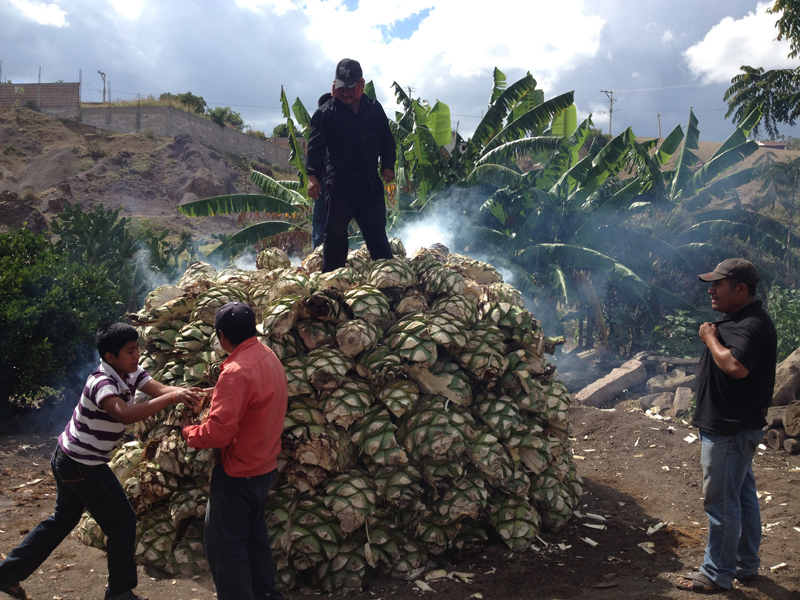 Tequila distillers, on the other hand, steam their agave, which has no such effect on its taste. The market for high-end single-vintage, single-estate mezcal is still extremely small, but it is growing quite rapidly. So pour yourself a glass neat or on the rocks and experience five centuries of Mexican history—something you surely won’t find in an overpriced blueberry-pomegranate margarita. Jeff Cioletti is author of the upcoming book, The Year of Drinking Adventurously and founder of the beverage travel site, DrinkableGlobe.com. He’s covered the global beverage market for 12 years at Beverage World Magazine, where he’s currently editor-at-large.